Finally Freckled: My First Ever Autumn Look Book! My First Ever Autumn Look Book! Hello lovelies! Today I am very excited to show y’all my first ever Look Book! This one is based on this crazy autumn we are having here in Cali. I swear, dressing for cold mornings and hot afternoons is driving my bonkers! …Did I really just use the word bonkers? Ugh. I’ll start off this Look Book with a casual outfit. Since I’m always running all over the place, I like the comfort of plain jeans with a t-shirt. This bag is a must in my wardrobe, it’s my every day, go-to purse. It goes with just about everything! 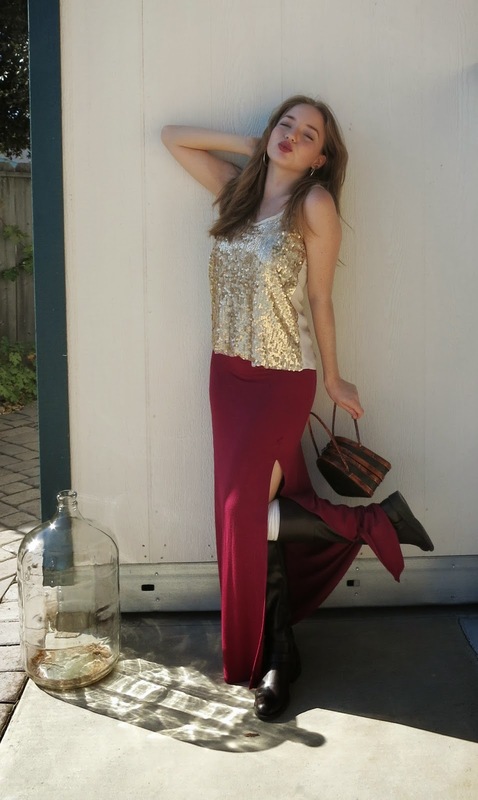 Time to bust out those beloved maxi skirts that you crazed over this summer and bring them into your autumn wardrobe! I’m pairing it up with these dark brown boots and white socks to tie it into the season. Since I opted for a sequence tank (it’s Holiday season, come on!) I want to make sure that I won’t get the chills-hence the boots. Before you say it, this look would probably leave you freezing if you aren’t as lucky as us here in Cali. Yes, we are spoiled. But if it were to be colder, I would toss on this amazing poncho. It might not be for everyone, but I for one am loving it! Everyone who wears dresses has to have a little black dress for every season. Well, here’s mine for autumn. If I were to visit somewhere a bit more chilly I would add some tights, but seeing how I was actually sweating today I decided to bare my legs! What makes this dress perfect for autumn? I have to say that the sleeves. I’m not one for puffy shoulders, but I must admit that this dress makes me feel like the Holidays are even closer! I am breaking the rules of fashion by pairing up this lovely black dress with some brown (yes, brown!) booties. But forget those! This dress has pockets! Leggings, leggings, leggings… What am I going to do about leggings? Yes, they are easy to slip on before morning classes. Yes, they are comfortable as all hell. But every other girl would be wearing the same thing! Change it up and show your daring side with these skeleton leggings! The amount of complements I receive because of them are endless. Because I want to make the bottoms the statement piece of this outfit, I have this oversized, sheer button up. Simply add a bandeau or bra of any color! I kept the best for last! I am at no words for this one.